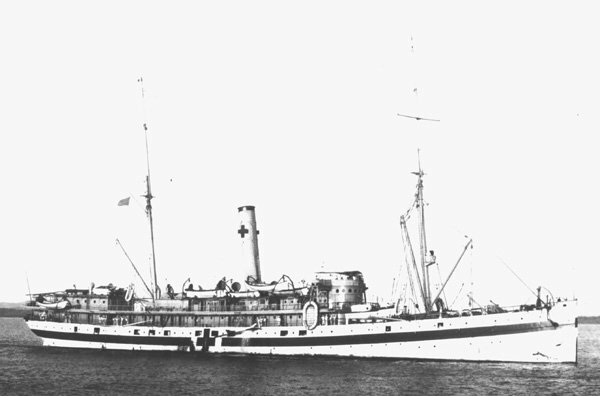 Laid down in 1896 as SS Creole at Newport News Shipbuilding and Drydock Co., Newport News, VA.
Decommissioned, 12 October 1905 at Mare Island Navy Yard, Vallejo, CA. 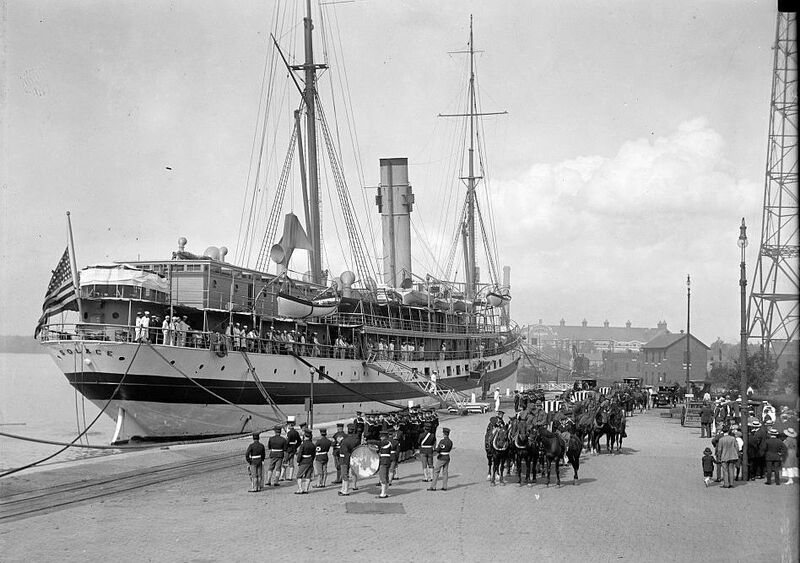 Decommissioned, 14 April 1909, at Charleston Navy Yard, Charleston, S.C.
Decommissioned, 20 July 1921, at Philadelphia Navy Yard, Philadelphia, PA. 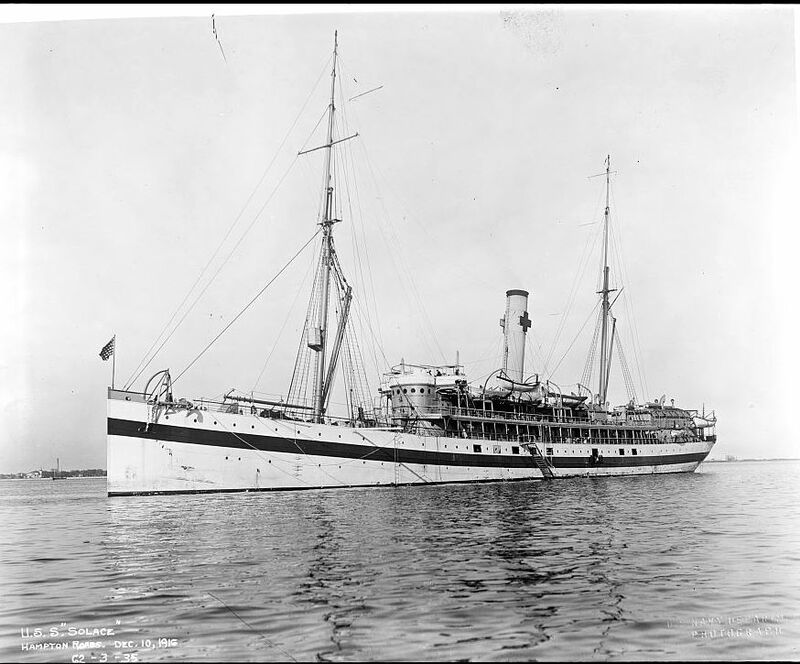 Laid up in reserve at, Philadelphia, PA.
83k USS Scindia and USS Solace [with white hull,] at Mare Island Navy Yard, Vallejo, CA., circa 1899. 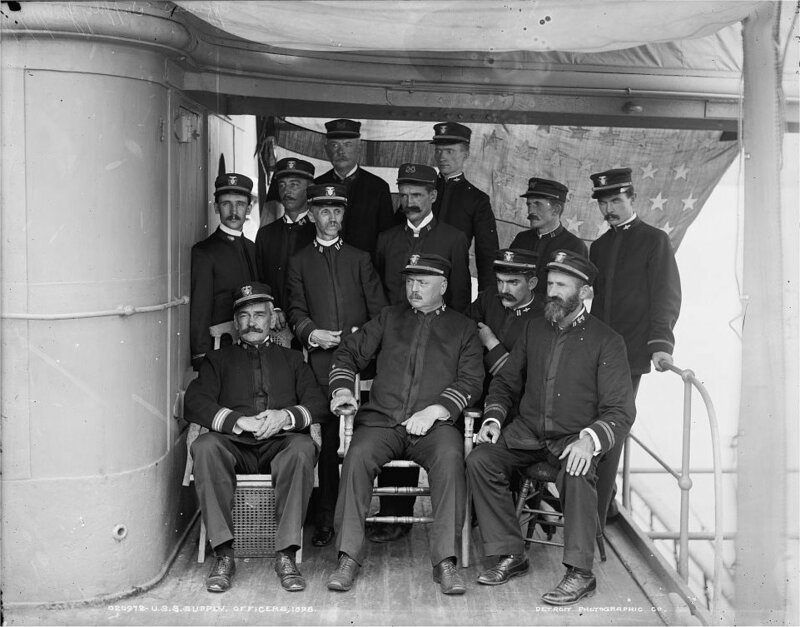 USS Ranger is moored in mid-channel, at the far left. 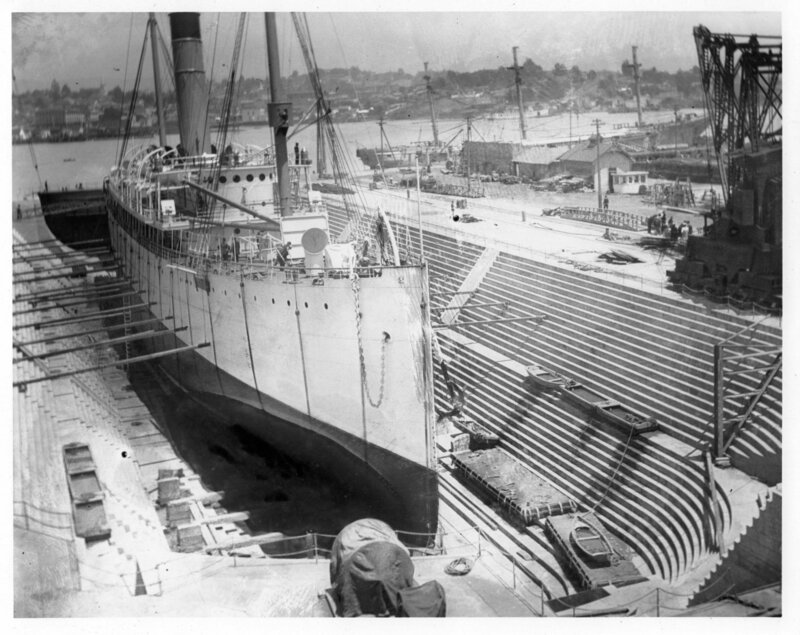 337k USS Solace in Mare Island Navy Yard's dry dock #1 with the USS Hartford at a berth to the right. 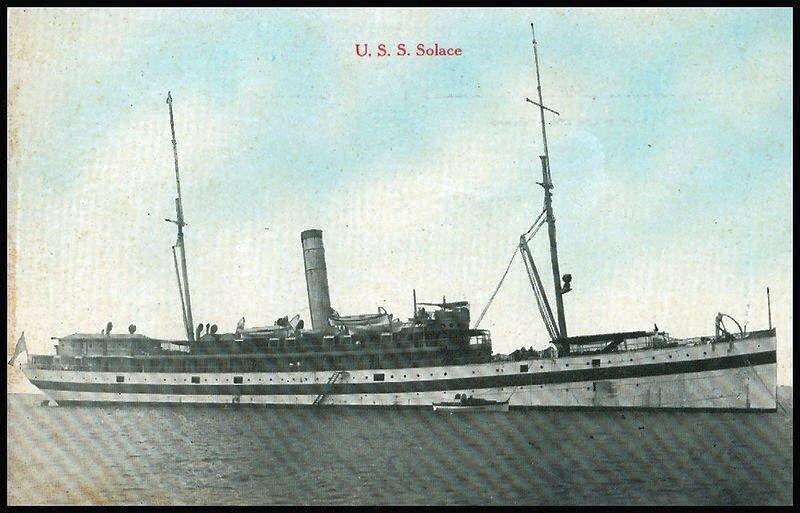 Solace was in dry dock from June 8 to 12 1899. 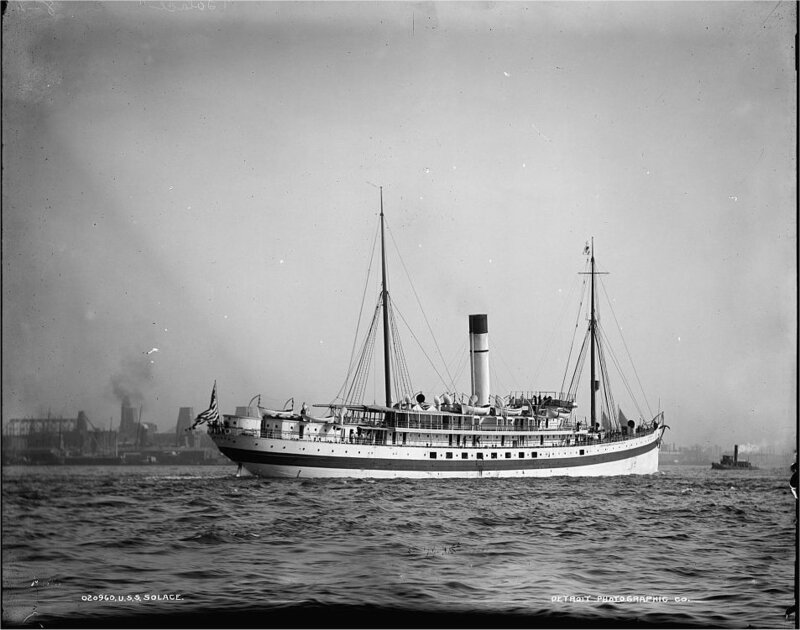 84k USS Solace off Mare Island Navy Yard, Vallejo, CA., 1 July 1899. 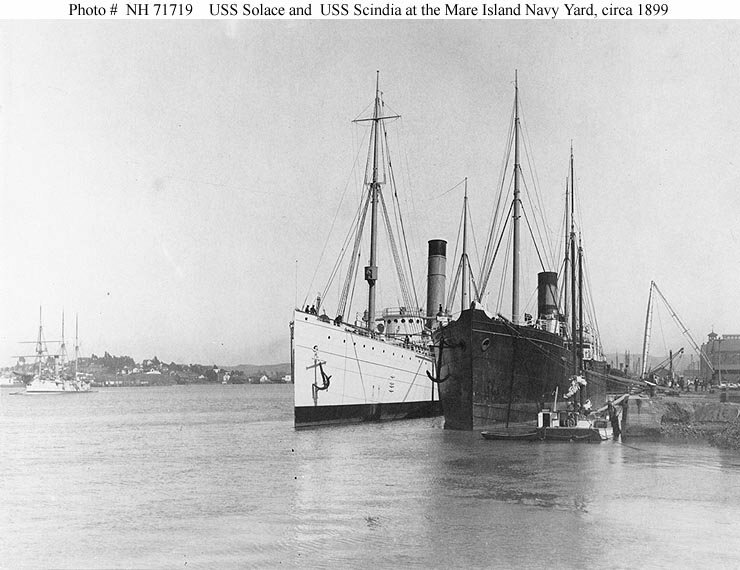 3502k USS Solace (left) and USS Manila (right) moored pierside at Mare Island Navy Yard in September 1899. 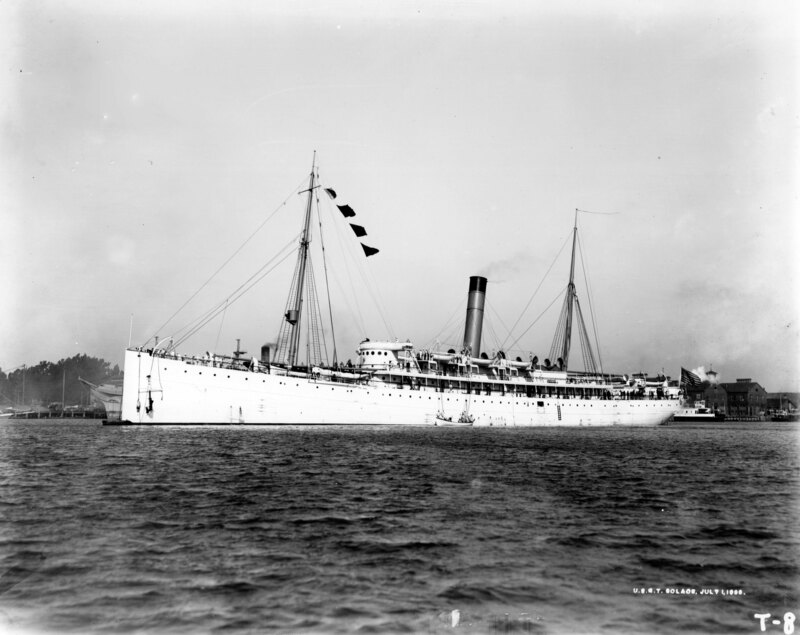 159k USS Solace off Mare Island Navy Yard while operating as a transport, circa 1903. 98k USS Solace at Naval Station Honolulu, T.H. 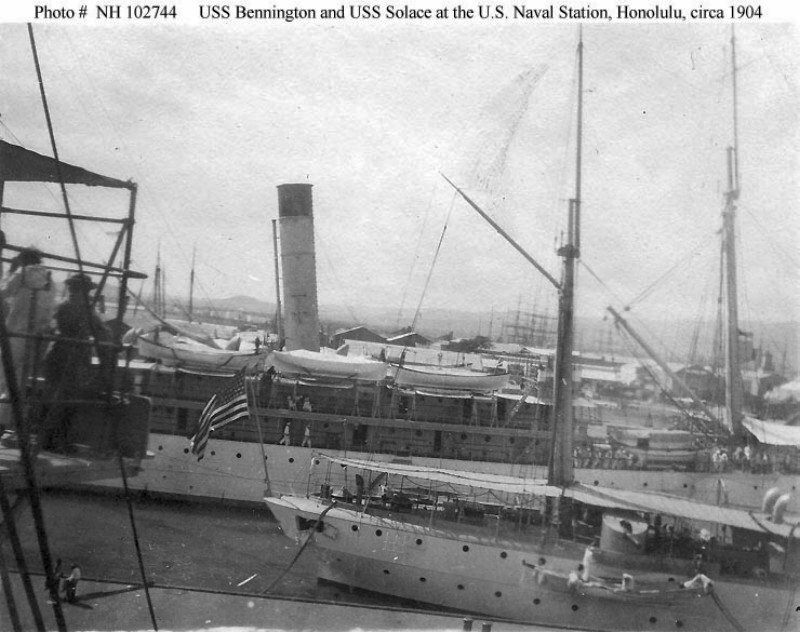 with USS Bennington (Gunboat # 4), in the foreground, circa 1904. 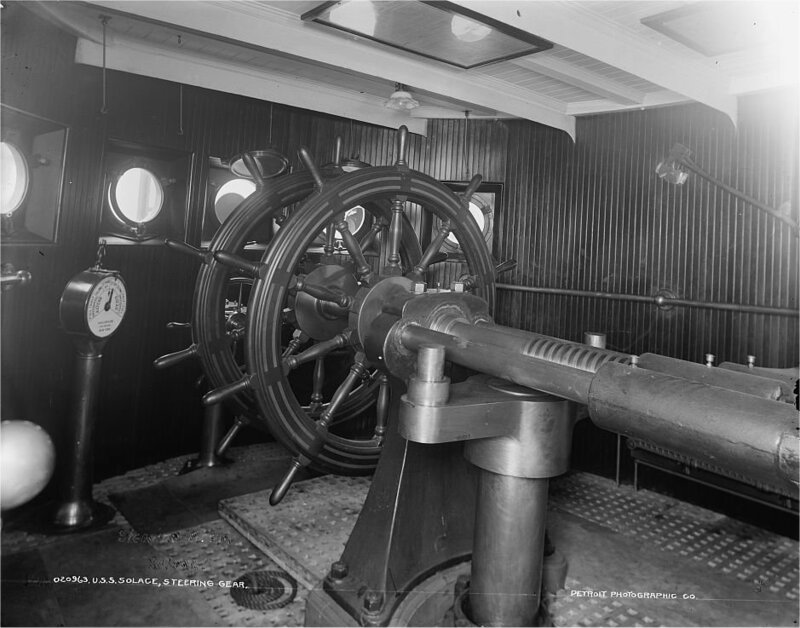 Probably photographed from on board USS New York (Armored Cruiser # 2). 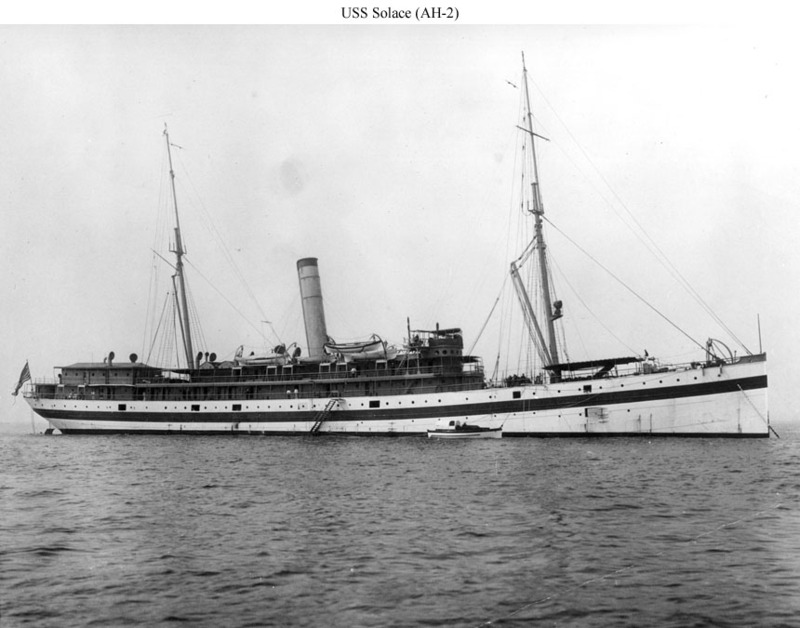 104k USS Solace moored pierside, date and location unknown. 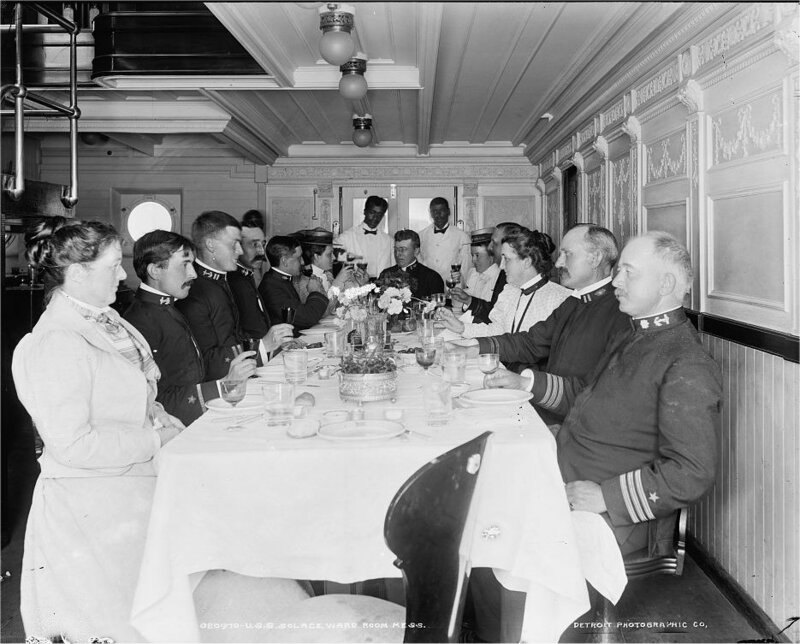 The photo bears the date "June 6" at the bottom. 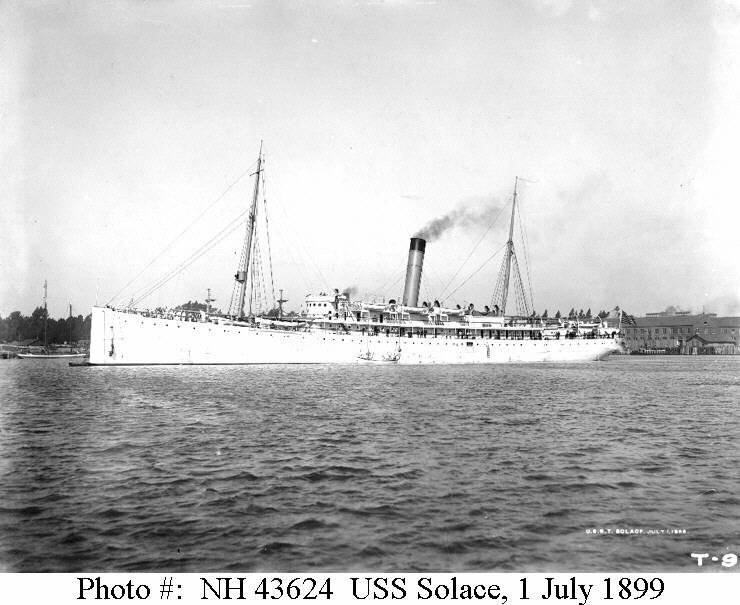 27k USS Solace underway, date and location unknown. 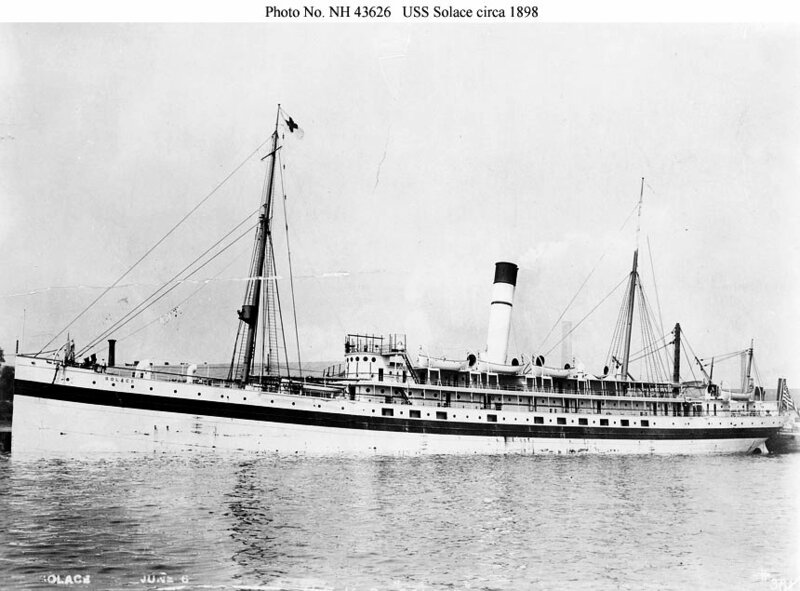 50k USS Solace under way, date and location unknown. 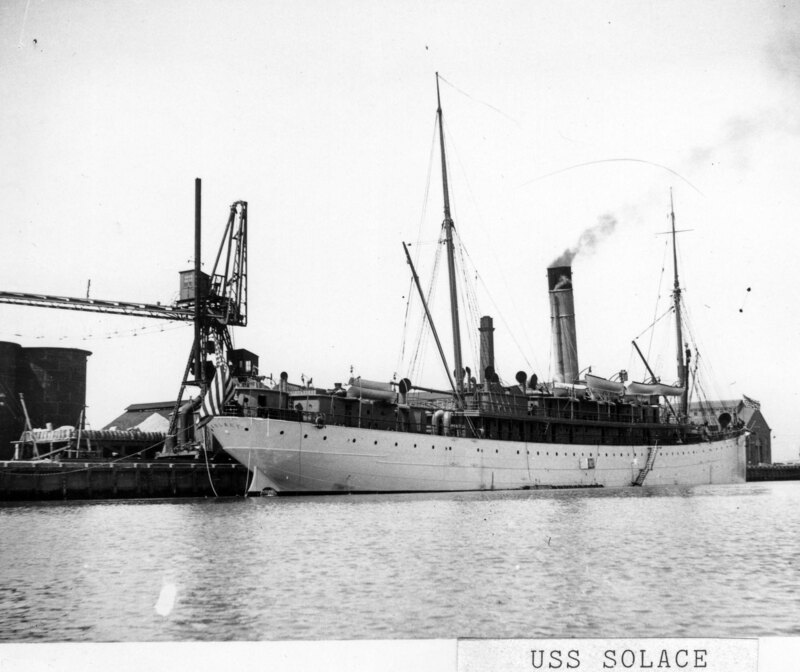 112k USS Solace at anchor in Hampton Roads, VA., 10 December 1916. 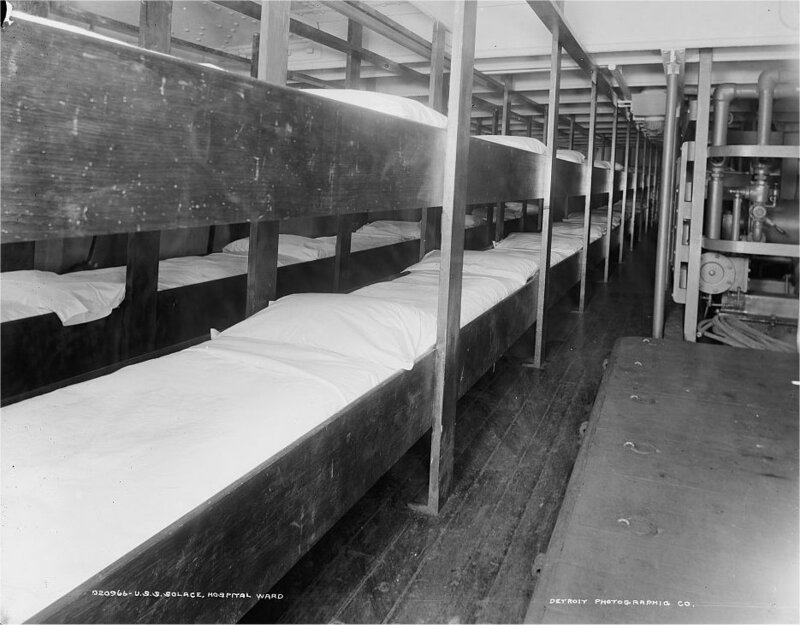 141k Caskets of United States soldiers being brought home by USS Solace from Europe, circa 1918. 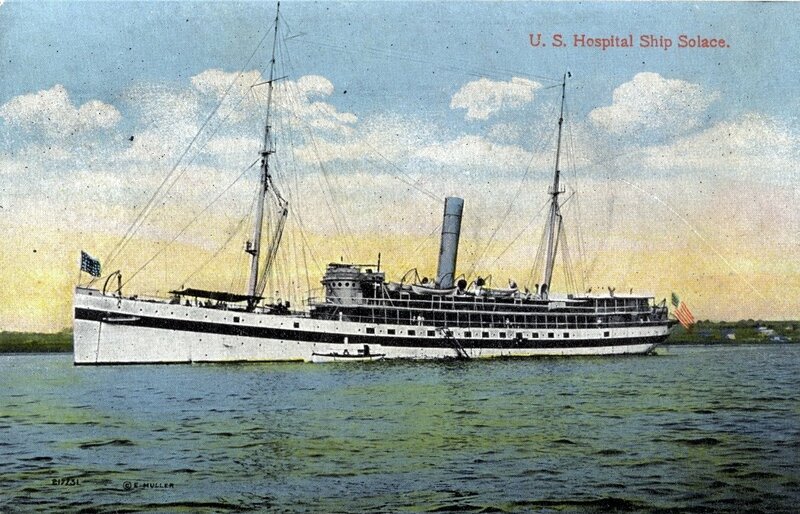 93k USS Solace showing the style of hospital ship markings used during World War I. 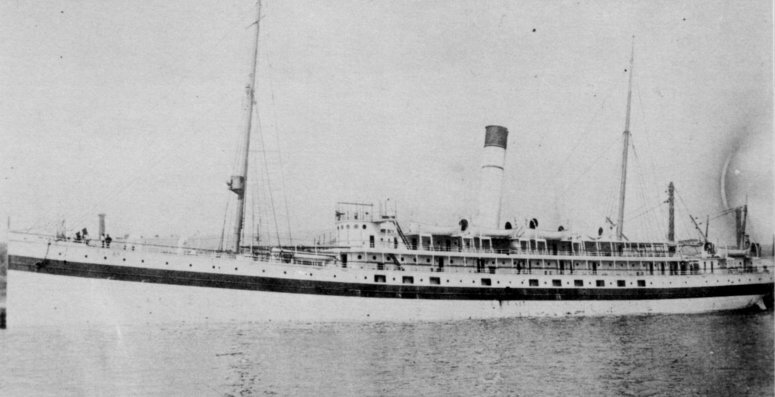 This photo probably shows the ship circa 1918-1919. 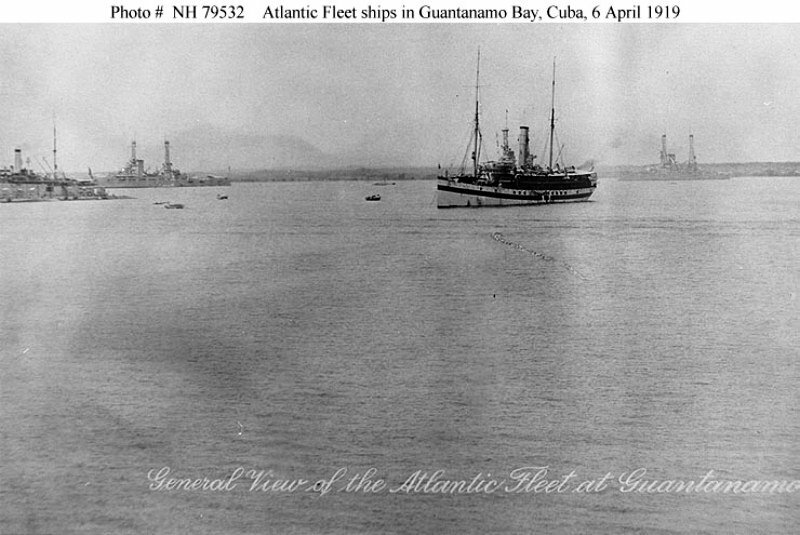 88k USS Solace at anchor in Guantanamo Bay, Cuba, 6 April 1919. 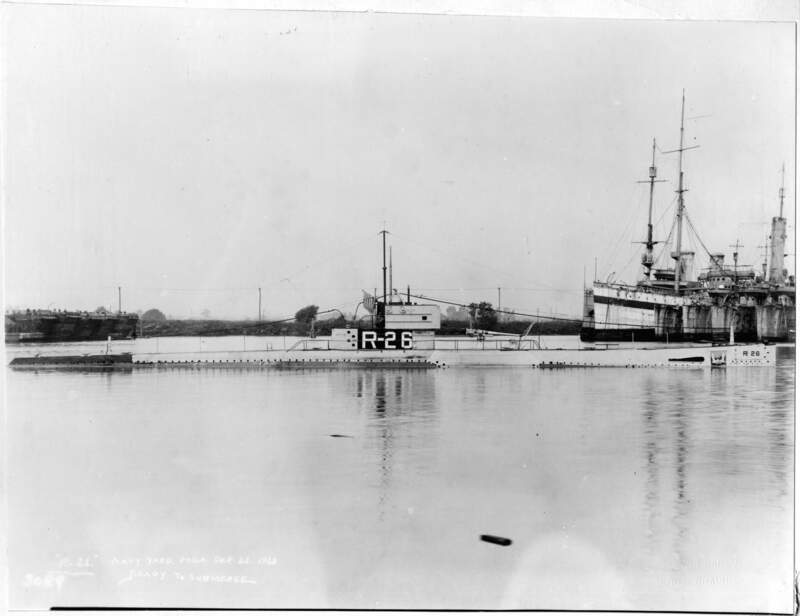 At left is USS Savannah (ID# 3015) with submarines alongside. 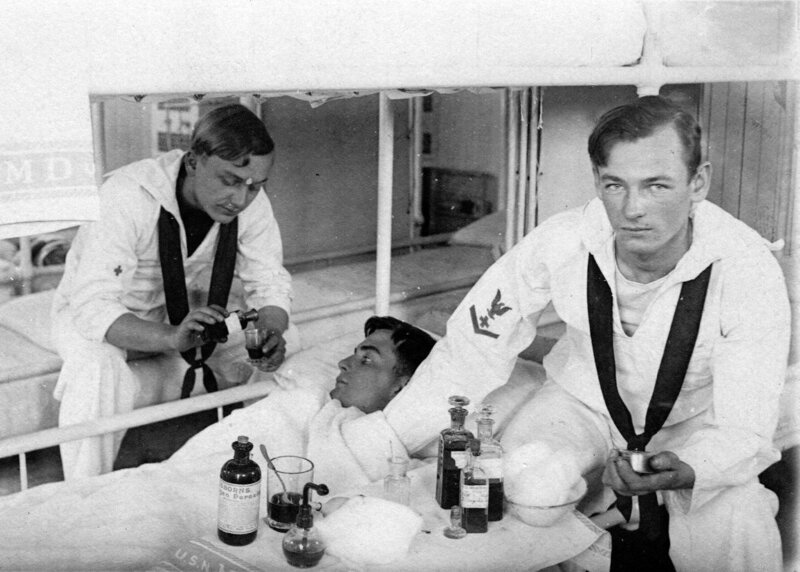 148k Lifting a patient aboard USS Solace from one of the ships small boats, date and location unknown. 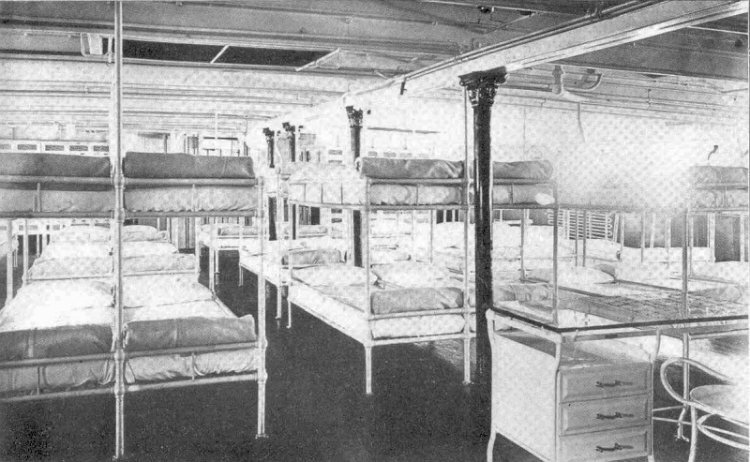 84k The main hospital ward aboard USS Solace. It could hold up to 68 patients and the surgical ward could hold up to 76. 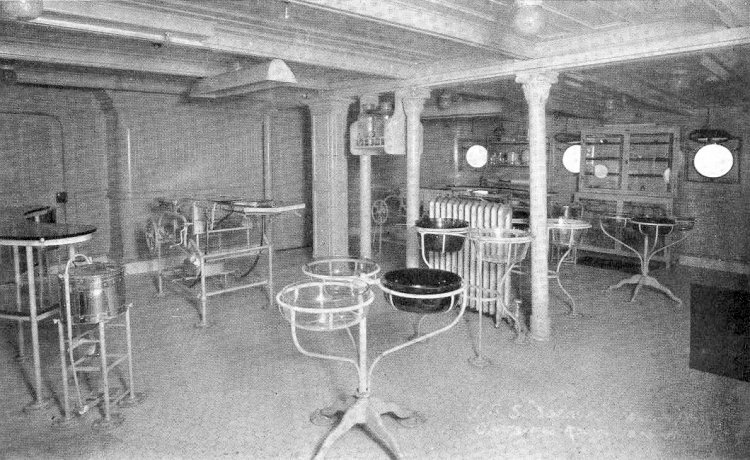 There were 3 isolation wards on the aft deck. 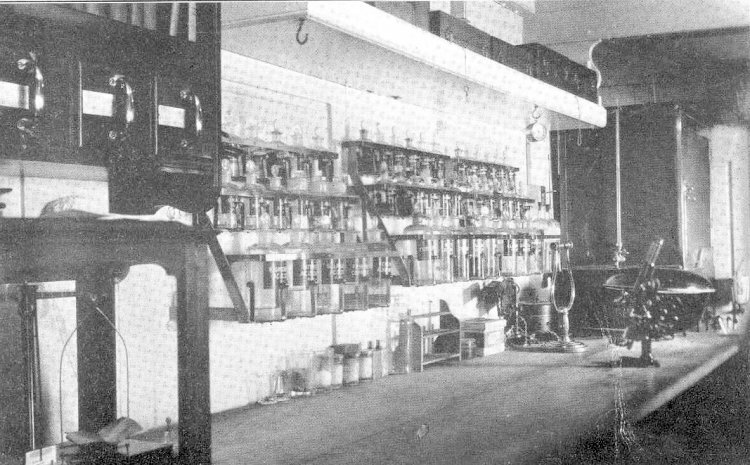 100k USS Solace ships laboratory. 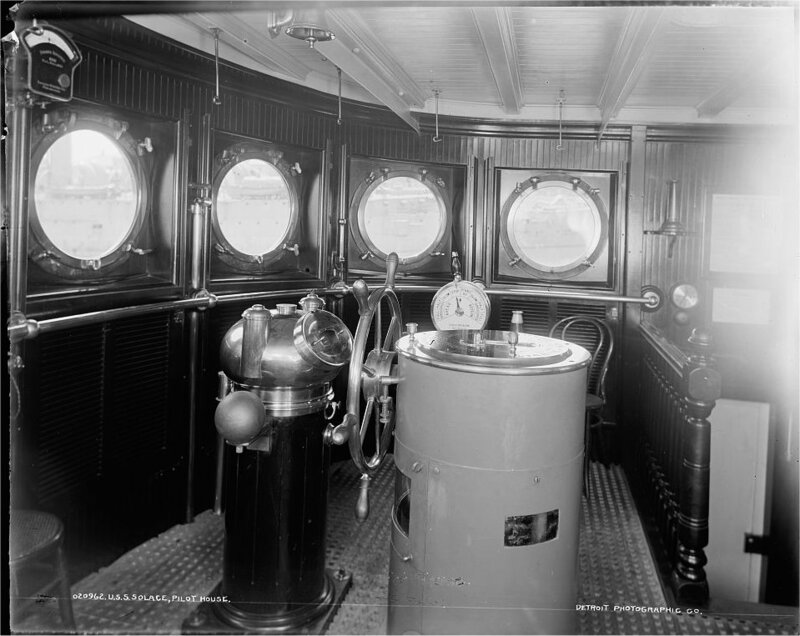 The latest in medical and sanitary technology was used aboard. 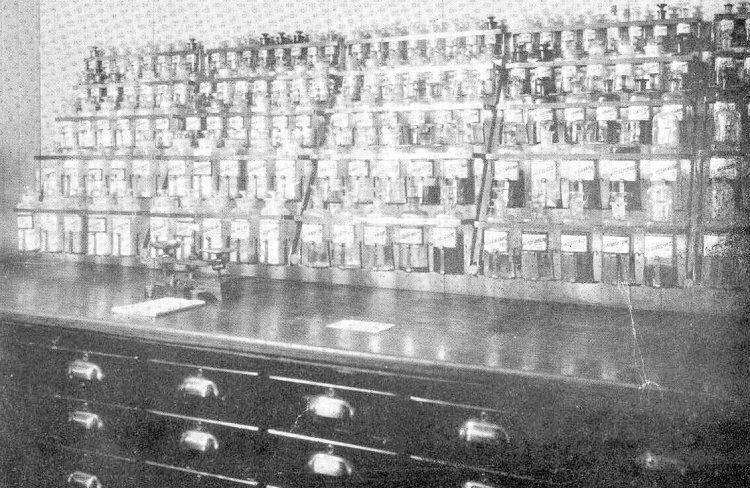 119k USS Solace dispensary and medical storeroom. 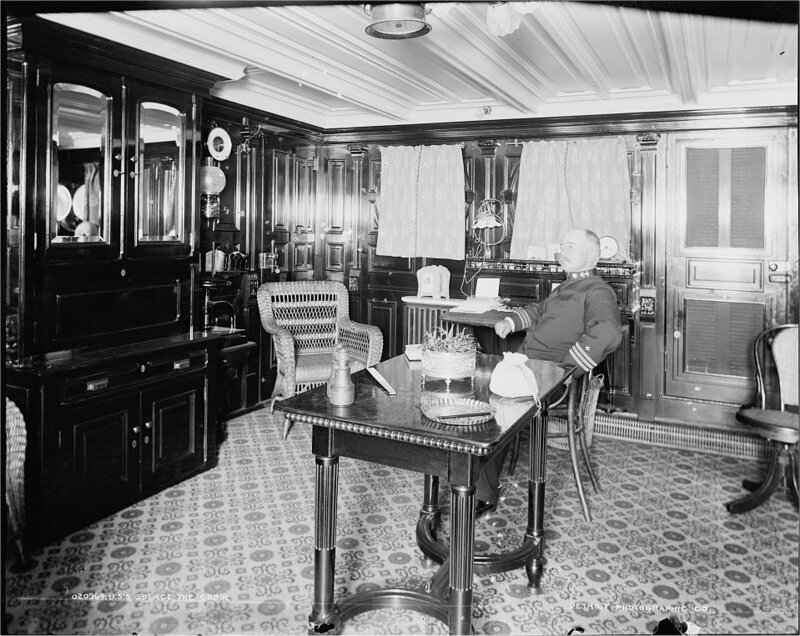 The ship also had a diet kitchen with all electrical appliances and on board ice making plant. 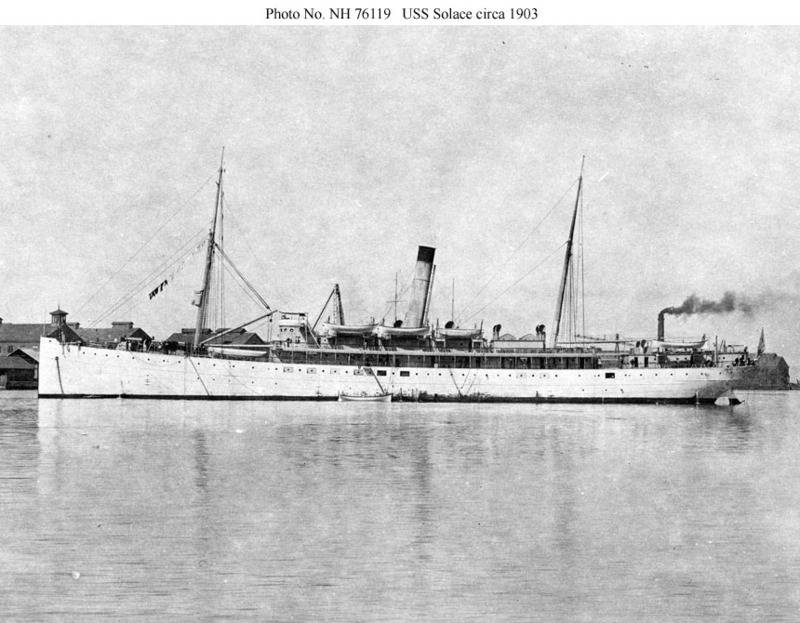 109k USS Solace operating theater that handled the dental, eye, ear and throat issues. 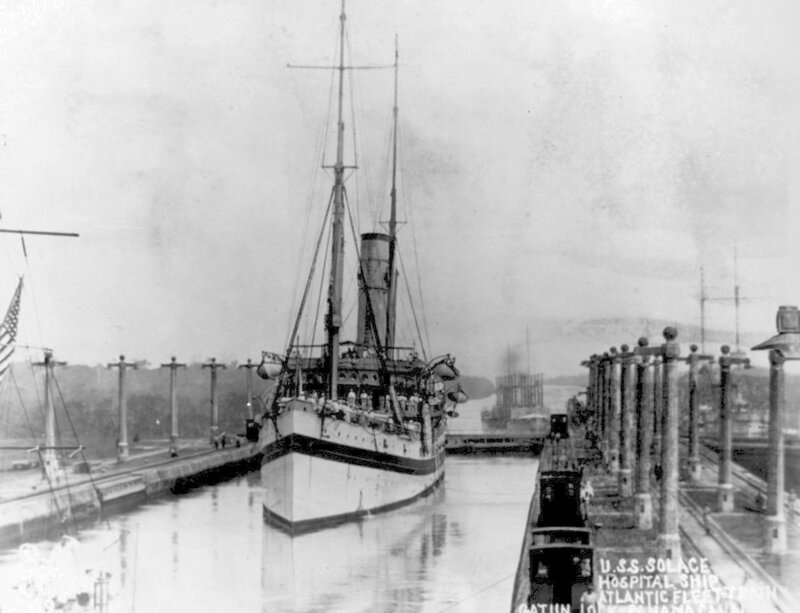 131k USS Solace in Gatun Lock, Panama Canal, early 1921. 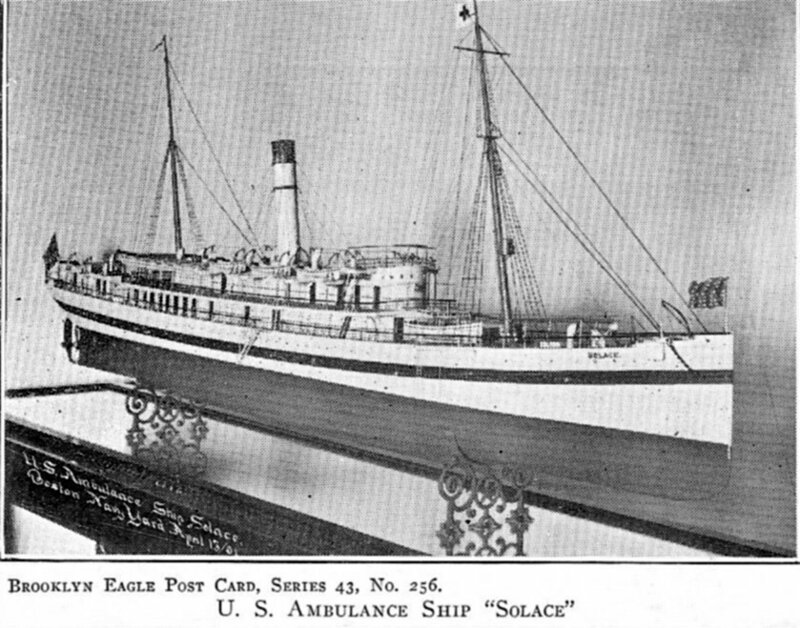 The Solace was decommissioned in July, 1921. 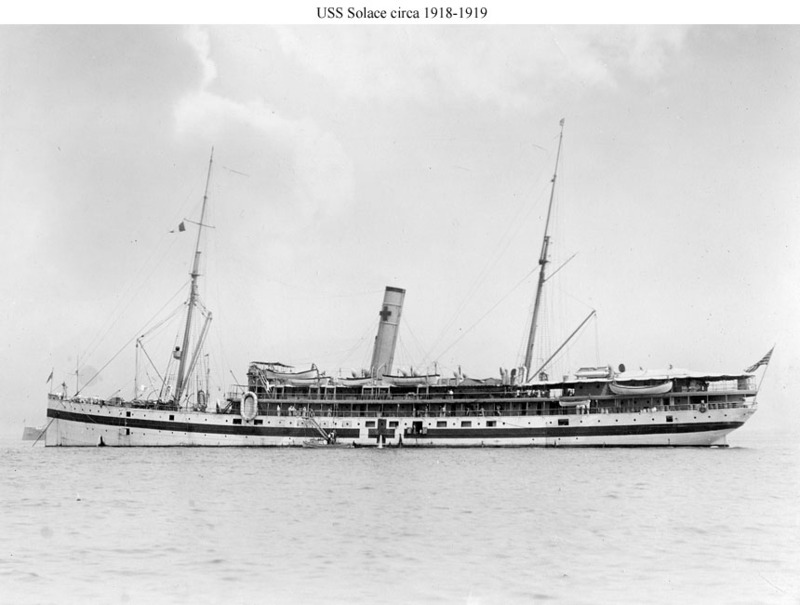 117k USS Solace at anchor. 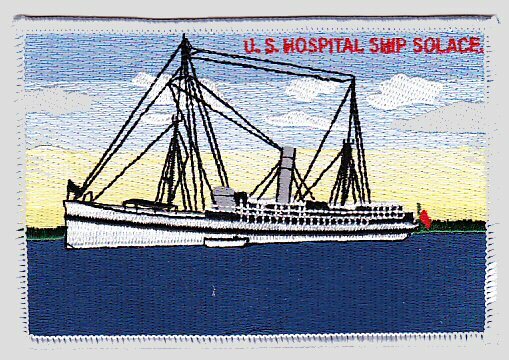 This style of hospital ship markings was used soon after World War I. 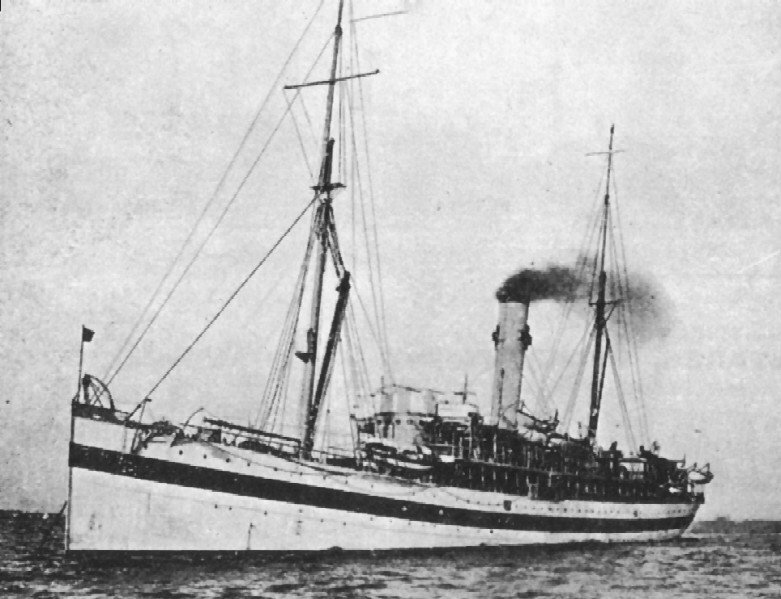 This photo may show the ship soon before her final decommissioning in 1921. 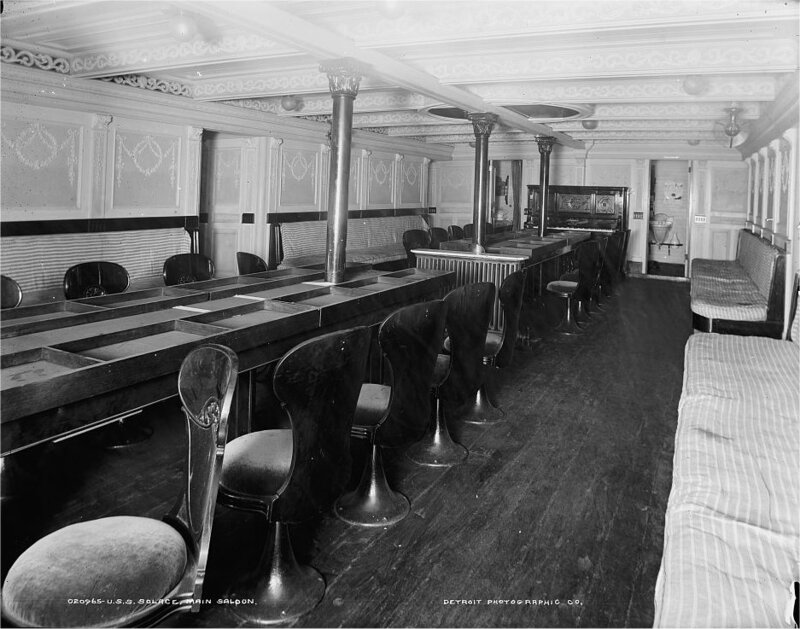 A post card of this image photo was also created. 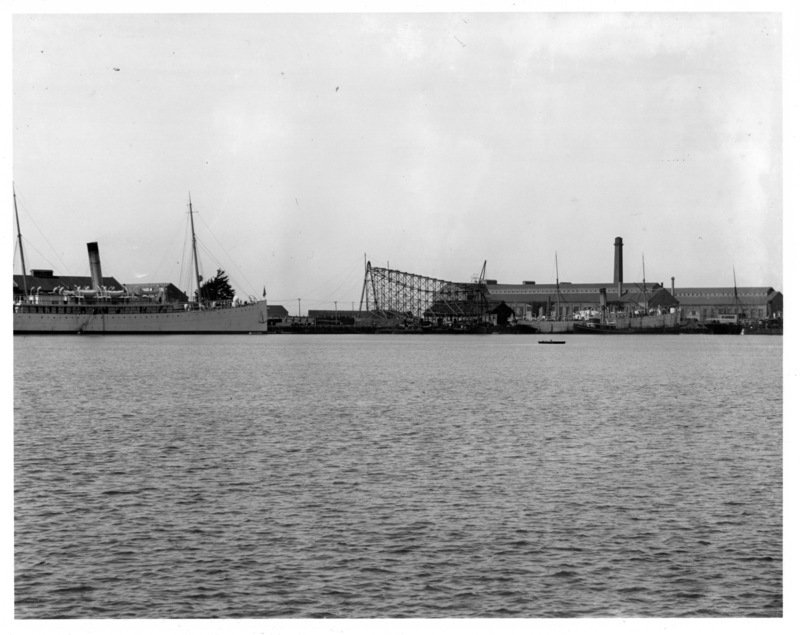 216k USS Solace (AH-2) (white hull) is among the laid up ships in the background in the upper right of this photo of USS R-26 (SS-103) getting ready to submerge at the Philadelphia Navy Yard, September 22, 1923.